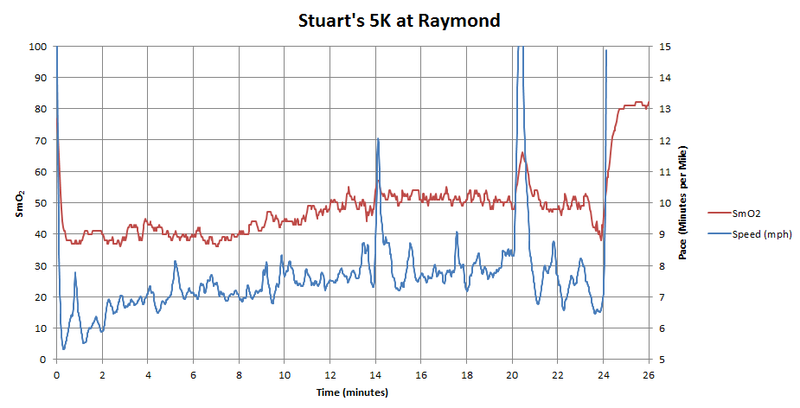 A nice graph (below) showing my first pairing of Moxy SmO2 Data (http://www.moxymonitor.com) and my running pace from my Motoactv (http://www.motoactv.com/). Thanks to Roger (my business partner) for pulling the two sets of data together to make this work. 1) The "speed" data is in minutes per mile, so lower numbers represent a faster pace. 2) The Moxy SmO2 data is in percent oxygenation, and is related to the 2nd (right) vertical axis, and lower numbers are associated with greater effort (or "work") on my part. 3) I took one water break at about 14 minutes, and one walking break at about 20 minutes. 4) The course was more "trail" than "road" - so for a good portion of the race I was in grass, dirt, mud, which all increase the amount of "work" I was doing to maintain speed. 6) Milestones: 14 minutes, water break; 20 minutes, walking break; 24 minutes, race is over, and I finally get into a true recover mode with SmO2 over 80% (AHHHH). 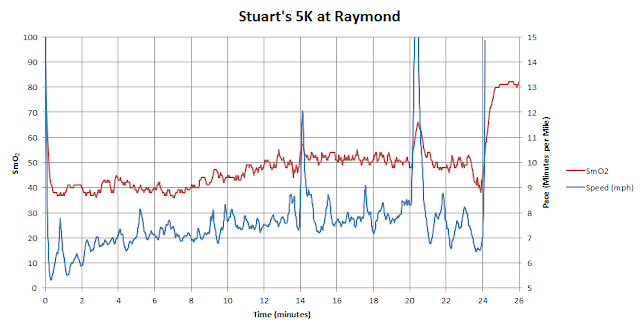 The Moxy data represented in the early minutes of the race represents a pace that I have never taken before in a 5k race, and was quite challenging for me. I was able to maintain a really fast pace for the first 2 minutes, then maintain a steady 7 minutes per mile for another 5-6 minutes. At that point my Anaerobic energy had been pretty much spent, and I have to continue the race at 50% or higher and use aerobic metabolism the rest of the way. The only exception is the last minute (just before the 24 minute mark) where I "kick" and give all I have left - again it's fairly obvious that I am pushed back into the anaerobic metabolism range (sub 50%). A direct correlation between speed and SmO2 is evident, but remember also that I was changing elevation, so the "work" I was doing isn't always well represented by speed - in fact the Moxy SmO2 data better represents the "work" I was doing. Therefore, when speed decreases (line on graph goes up), and my SmO2 goes down (line on graph goes down), it is likely due to a hill climb. The opposite is also true when going down hills.